No analysis of the Toronto 311 call data can press its task without firming its grasp of the meaning of the fields themselves, not all of which can be fairly described as self-evident. Let’s see. Calls Offered appears to mean nothing other but calls received, and Calls Answered appears to mean precisely what it says – namely, a count of the calls which 311 operatives actually attended, though this measure does not want for ambiguity (Look here, in particular pages 10 and 11, for some of the definitional issues, along with a battery of critiques of the 311 operation). Exactly why the unanswered calls lurched into the void ain’t, as the song says, exactly clear, particularly in view of the fact that some of these may have been in fact mollified by recorded messages. Again, check the report linked above.) Call Answered %, in any case, simply divides Calls Answered by Calls Offered. and copy it down I, remembering to mint the column in Number format, sans decimals. These quantities can now be properly summed and averaged, etc.., thus honoring their real contribution to any calculated whole. 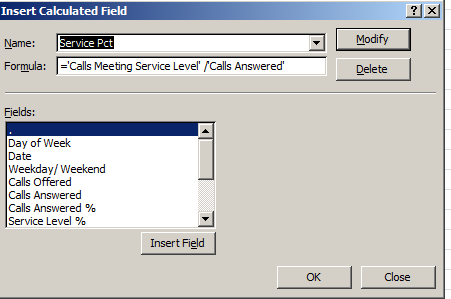 Calls Meeting Service Level (both Sum. Note this field likewise requires a decimal-point reduction, because the round-off we executed earlier won’t extend to the pivot table. Remember that in any case these roundings only format the numbers, without transmuting their actual values. evaluates to an indifferent -.135, or a very small negative association between numbers of calls and response alacrity, per the 311 guidlines. Here the picture changes. 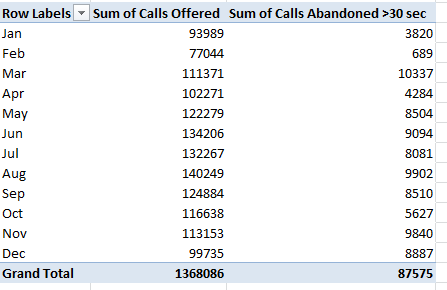 Service percentages associate far more tightly with call volume (operationalized here by Calls Answered), at -.55 (I simply ran a CORREL with the 12 Calls Answered and Service Pct cells above); and that makes rather straightforward sense. More calls to answer, longer response times. And if you add Calls Offered to the above table (Sum, again) and correlate that parameter with Service Pct, you’ll get -.716, a pretty decisive resonance. The more calls in toto, the fewer that penetrate the 75-second transom. Correlation between that field and Calls Offered: a mighty .881. Doesn’t a certain existential charm devolve upon confirmations of the obvious? Hi Abbott, Keith McDonald here adding a note to your post #2. I’m told by the 311 folks involved in collecting the data that there is one point of confusion in the post.
. the service level discards the unanswered calls.
. abandoned calls are factored in the calculation.